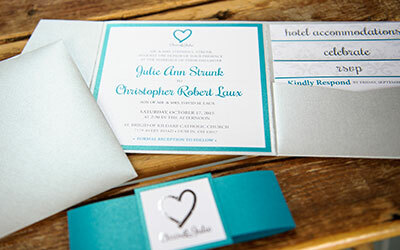 Featuring our client favorite — the Pocket Invitation. 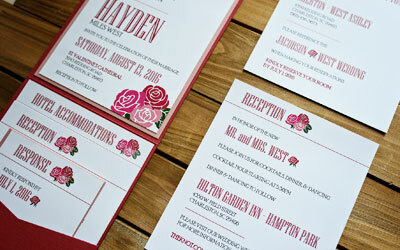 Your wedding invitation sets the tone for your entire wedding — why not have it custom designed? 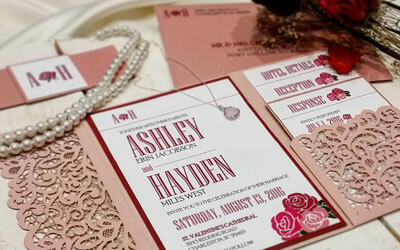 Our Wedding Brand is here to create your perfect wedding invitation. We'll be your advisor through the entire process — from helping you select the right style and colors, to providing recommendations on wording, all the way to selecting your postage. Plus, we'll keep you on track to make sure your invitations go out on time. So you're asking — What's included in my invitation? We're here to make the process as easy as possible. 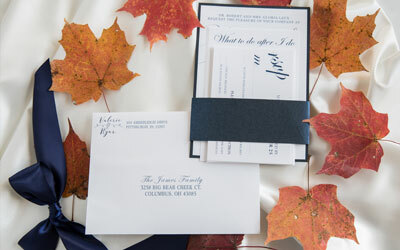 That's why we have two Wedding Suite Packages — Simplistic & Signature — that both include a complete invitation. 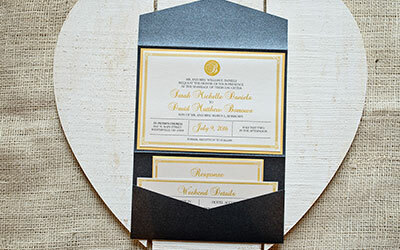 Our complete invitation includes a matted invitation, pocket fold, RSVP card, a pre-addressed RSVP envelope, up to three additional inserts, bellyband with matted logo, and pre-addressed printed envelope. Offering complete invitations within our flat-rate Wedding Suite Packages allows you to focus on the design of your invitation and not the cost. All of the examples below are complete invitations. If you're interested in what we can design for your wedding, please contact us! Flat PanelSimplicity at its best. This style features a matted invitation with up to four floating insert cards held together by a bellyband. Pocket Invitation - SignatureA classic style that features a portrait invitation and up to four insert cards nicely displayed on the right. Pocket Invitation - SquareA more modern approach, these square invitations provide a little more room for extra details. Pocket Invitation - VerticalAnother great blank canvas! 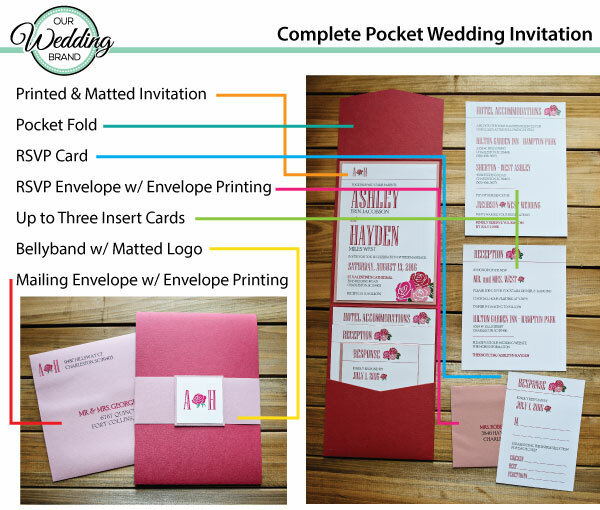 Pocket Invitation - Panel PocketThe best of both worlds! Flat panel invitation on one side, pocket on the other. 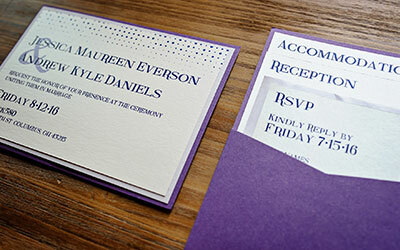 Pocket Invitation - Rectangle PocketA mix between the Vertical and Signature styles. Custom & Laser CutLooking for something more unique? No problem. We'll help you design the invitation of your dreams. 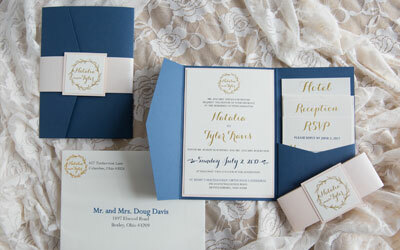 Add elegance to your Save the Dates, wedding invitations or other wedding materials by incorporating accents of silver or gold metallic ink or silver or gold foil. Contact us for more information and for pricing based on your unique project. 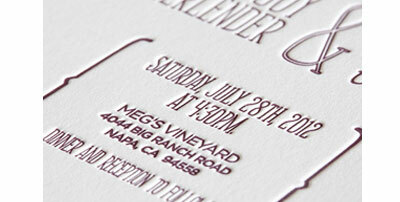 Letterpress is a unique printing technique that "presses" the words or artwork into a thick piece of paper. Please contact us for more information. OUR WEDDING BRAND | Specializing in custom pocket wedding invitations, wedding logos, custom save the dates, custom cake toppers and more in the Columbus, Ohio area and nationwide.